FILMARTworks is finally back on track! Microbrews in Las Vegas are all over the hotels, casinos, and just about any of the prime spots where commercial establishments stand tall. A number of microbreweries around invite locals and tourists alike for a dose of fun, food, and drinks. For those looking for freshly brewed beer of the best quality, here’s a shortlist of some of the best Las Vegas microbreweries where beer drinkers can splurge and indulge. Triple 7 Restaurant and Microbrewery located at the Main Street Station Hotel in Downtown Las Vegas boasts of award-winning microbrews including six varieties of the freshest and finest handcrafted beers in town. It serves lunch, dinner, and light night menus. It also features a happy hour, a sushi menu, and graveyard specials daily. With a look and feel of an upscale sports bar, Triple 7 features mounted TV sets where guests can cheer for their favorite teams and athletes while soaking up mug after mug of their favorite brews like the High Roller Gold, Royal Red Lager, Market Pale Ale, and Blackchip Porter — all named after gambling terms. In addition to their exceptional selection of year-round line-up of brews, they always have a seasonal brew (Black Cherry Stout brewed with cherry juice and chocolate roast flavor), and a brewmaster’s reserve (India Pale Ale with a fresh hop aroma). There is also a microbrew sampler where guests can get five 5-oz pours for only $5. Menu favorites include a number of appetizers, succulent ribs, fresh seafood choices, handmade pizzas, pasta meals, and specialty burgers and sandwiches. Food selections are served in huge portions and the price range entices even more patrons to come. There are suggestions for which beers or wines pair best with each dish. There are even some dishes cooked with the brews. Bestsellers for snacks and meals to accompany the brews include the Prime Rib, Focaccia Vegetable Sandwich, Chicken Philly Sandwich, Meatball Sliders, Garlic Fries, and Nachos Grande. For those with fascination for beer and finger foods, Gordon Biersch Las Vegas offers exceptional selections of beer, meals, and snacks. It offers seasonal menus, daily specials, and regular add-ons to the distinct menu list to suit the ever-changing preferences of guests. It also features a unique atmosphere with fine spaces for social gatherings, casually sophisticated dining occasions, and private dining events for friends and colleagues in groups from 15 to 500 people. Gordon Biersch serves brunch every Saturdays and Sundays until 3:00 p.m. Lunch and dinner are available daily. The happy hour menu features very extensive food choices from fancy fried artichoke hearts to sweet chile glazed chicken wings. Bestselling beers here include: the Marzen, a popular Gordon Biersch beer with a mildly sweet lager; the Hefeweizen, a light of German variety; the Pilsner, a crisp, golden, highly hopped lager; and the Blonde Bock, a medium-hopped beer with a rich flavor. 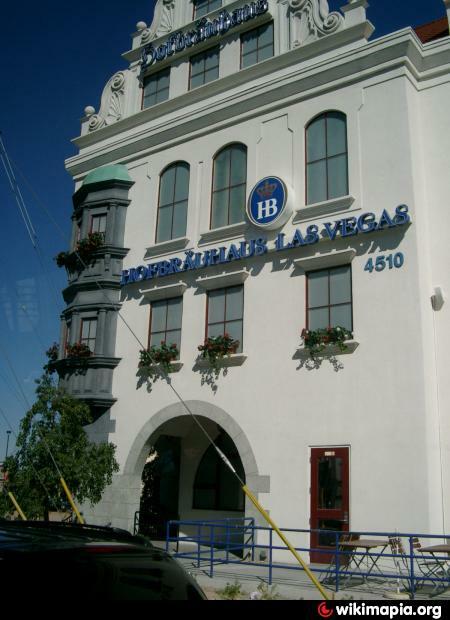 Located within Paradise and Harmon right across the Hard Rock Hotel and Casino, Hofbrauhaus Las Vegas is a replica of Hofbrauhaus in Munich, Germany. This Vegas microbrewery has three versions of the famous microbrewed Bavarian favorites: the Hofbrau Original that has a slightly bitter flavor; the Munchner Kindl Weissbier, a light-colored beer brewed with wheat; and the Hofbrau Dunkel, a sweet, dark brew. There are seasonal beers as well including the Maibock and the Oktoberfestbier, which are available every April and October. The Bavarian atmosphere features live music directly from Germany and the chefs prepare authentic food from the region. The Hofbräu beers are brewed using the original recipes handed down by Wilhelm V, the Duke of Bavaria from over 400 years ago. They are imported direct from the breweries in Munich, Germany for that fresh, pure, and satisfyingly authentic taste of Munich. Hofbrauhaus Las Vegas has a festive beer hall and air-conditioned beer garden. Its music, menu, towers, windows, balconies, and even its roof tiles are all replicated from the 1589 original Hofbrauhaus. This microbrewery also features live entertainment every evening where guests are free to sing along, dance to the beat, or propose toasts. Favorite orders to accompany the Bavarian brews include the Hofbrauhaus Wurstplatte Vienna Style Frankfurters, German Bratwurst, Schnitzel, and Brotzeitteler. The Beer Garden or “Biergarten” is inspired by a genuine Munich garden that is polished to perfection with a year-round blue skies, patio dining, and a water fountain. It has a seating capacity of 430 guests. From mainstream essentials to independent flair, Rianne knows the drill in making entertaining and well-meaning productions. She can lead a pack passionate about extreme action and technological edge; she can breathe an endearing and sentimental style for a team with a sweet disposition.